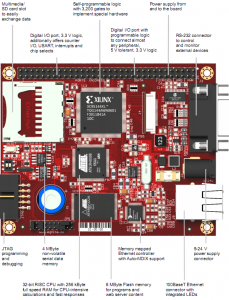 ARM microcontrollers have developed to become undisputed market leaders. 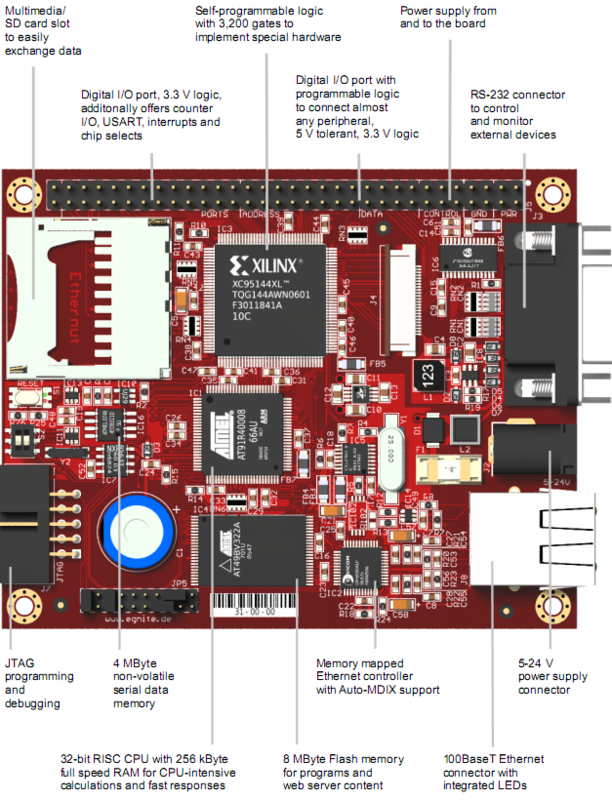 Ethernut 3.1 is a network compatible single board computer based on the ARM7TDMI, which is combined with a programmable logic module. The third generation of the Ethernut family offers quick response time with minimal power consumption. Running in internal RAM the 32-bit CPU processes around 72 million commands per second and the programmable logic enables the implementation of special hardware interfaces. 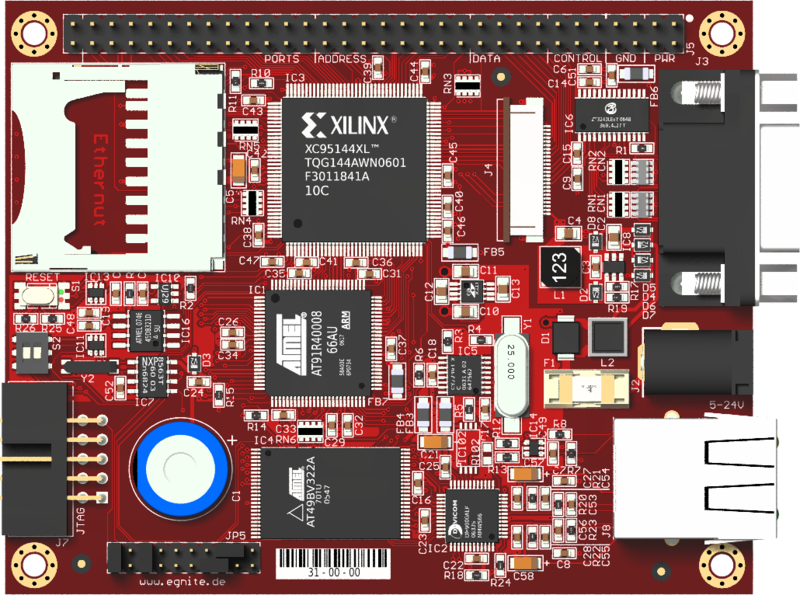 8 MByte´s of flash storage and a socket for MMC/SD cards offer sufficient capacity for more challenging tasks. Although pre-configured for Ethernut 3.1, all important settings can be customized with just a few mouse clicks with an easy to use graphical interface available on Linux, Windows and Mac OS X PCs incorporating any special requirements. A complete Internet enabled web server needs about 100 kByte Flash and 20 kByte RAM. This leaves enough space for ambitious product ideas, including a boot loader for the update of firmware via the network. Many useful example applications are included in the distribution. 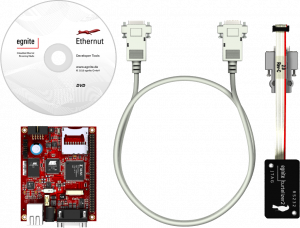 Ethernut 3 is shipped with a pre-installed boot loader, that helps you to easily run own firmware or examples from NutWiki. 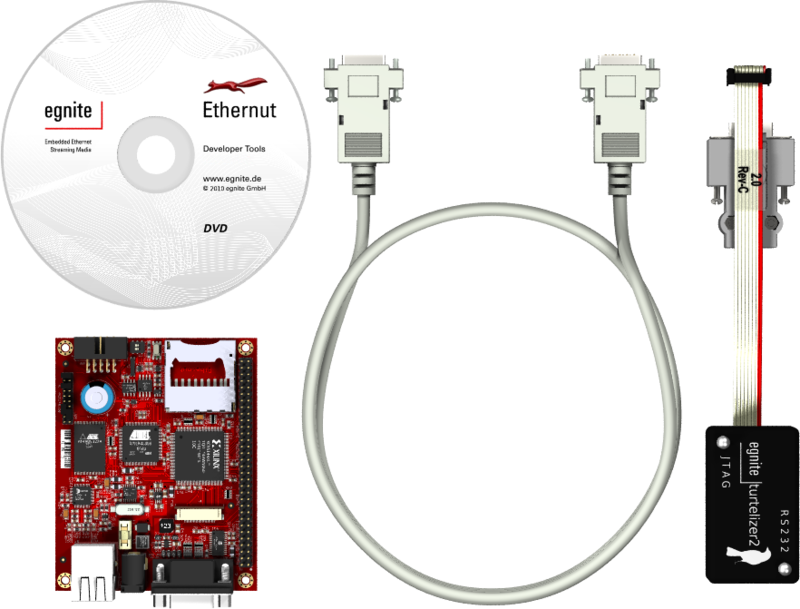 How to do that and how to put Ethernut 3 into operation is explained in the Ethernut 3 Hardware Manual. Detailed information and instructions on how to to persistently install firmware images on Ethernut 3 can be found in the document Booting Ethernut 3. To develop applications in Nut/OS, you should start reading Nut/OS on Ethernut 3, which explains how to configure and set up Nut/OS. The software manual describes the basic procedures of Nut/OS development. A detailed description of all OS functions can be found in the Online Reference API. The NutWiki provides an extensive collection of example code as well as further resources for developers. Ethernut 3 is also equipped with a programmable CPLD. The tutorial Nut Programmable Logic describes the first steps. How to program the CPLD with Turtelizer 2 and OpenOCD is explained in Ethernut 3 CPLD. All available documentation can be found on the Ethernut 3 page on ethernut.de. Default memory layout for Ethernut 3 after runtime initialization.